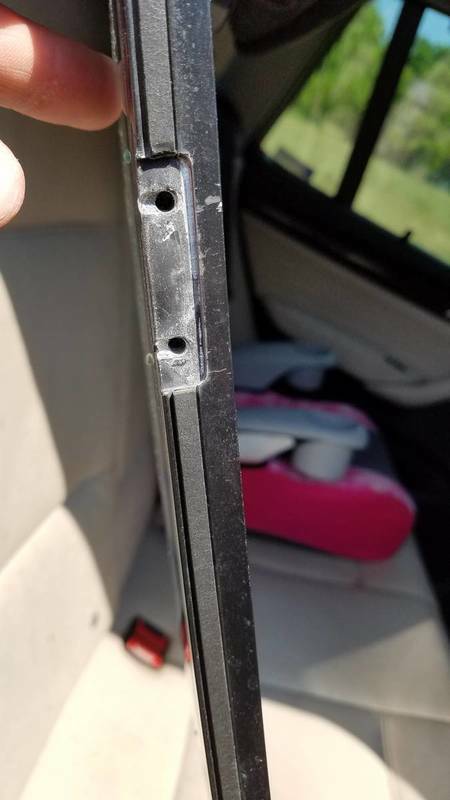 Looking for recommendations on fixing a windshield screw issue that I have. The screws holes on the frame have stripped out on the part that opens to let people into the bow. The material does not look very thick to put an insert in. I was thinking maybe JB Weld or jam little pieces of wood in there and then screw into it. The screws that hold it are a wood screw type thread. Any thoughts or ideas would be appreciated. I'd be more inclined to drill and tap for a stainless machine screw. What size is in it now? Is it possible to get a nut or a threaded bar behind the hole? How many screws are stripped? Also, why did the threads strip? Were the screws loose for a long time? Im not sure there is enough material there to drill and tap for a machine screw, as in the thickness of the material. I might be able to get a nut on the back side if i ripped the window frame apart. Not sure how these are held together. There are only 2 of the holes in 1 hinge that are stripped. These were like this when I bought the boat. I think they came loose with the previous owner. The other holes seem fine to me. Attached a picture so you can see what I am looking at. You might be able to get inserts to work if the hinge will lay flat in the recess and not wiggle around. Maybe try metric screws so the thread pitch is a little finer. If everything mates up well and gets tight, take the screws out and put some blue thread lock on them. If that doesn't work out, take the frame apart and either use backing nuts or have someone weld the holes so you can start over with the screws.